My friend Daneen asked earlier in the week if I would be up for a ride on Saturday. 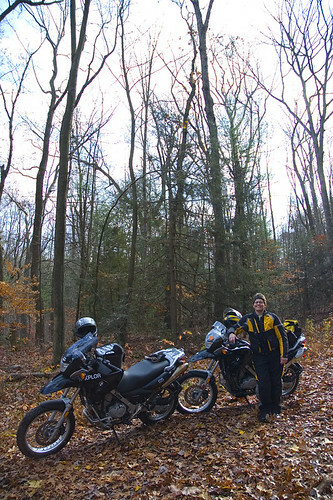 She has new knobbies on her BMW F650GS and wanted to test them out. I decided that we could ride out to Swatara State Park and ride along the Swatara Creek. The ride on I81 was boring as usual. But once we got to Old State Road the ride was beautiful. The leaves on the trees were perfect and the weather was warm. We briefly stopped to disable our ABS and headed down the road. To my surprise there was a gate open on a road that headed off towards the Creek. It wasn’t really a road though. It was the width of a road but it was nothing but leaves. Which meant extra precaution because you can’t see what’s under the leaves and the leaves are slippery. This path led us along some sort of pipeline as we went up and down several hills until we came out at the Swatara Creek. We stopped to shed some of our gear (it was getting how because we were unable to go fast) and walk down to the creek. The road went through the creek and up the other side. It wasn’t deep. But the rocks are covered in algae and the water would be dangerously cold if one of us were to drop our bikes in the creek. We backtracked a ways and turned left on another path that headed out towards the road. This brought us to a gate but we were able to ride around it and continue onto Old State Road. We road to the end and turned around. Damn these bikes are fun! Coming back towards the Appalachian Trail I practiced my wheelie routine since I wasn’t really on a public road. Just got the front end up a few inches and I shared my technique with Daneen who decided she didn’t want to try it (even though her other bike is a BMW K1200R). I let Daneen lead the way back to Harrisburg, PA. We took 443 (Fishing Creek Road) through Fort Indiantown Gap which was the perfect scenic route to end the day of riding. It’s not time to put the bike away yet!